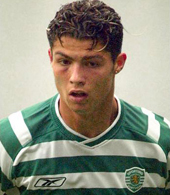 Cristiano Ronaldo is a Sporting Lisbon player through and through. 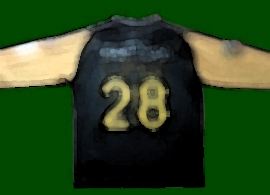 He was in the Sporting Clube de Portugal football school from 1996/97 to 2001/02, played in the main team in 2002/03, making 31 games and scoring 5 goals, and still played the presentation game of the following season, 2003/04, against Manchester United. 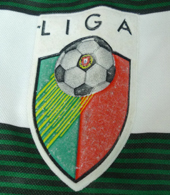 There are not very many Cristiano Ronaldo matchworn soccer jerseys around, and real Ronaldo match worn shirts from his short year with Sporting seldom appear for sale. They are normally not bought by Sporting collectors, but by Cristiano Ronaldo collectors from abroad. You can see shirts from other Sporting players here and more Cristiano Ronaldo Sporting Lisbon jerseys here. 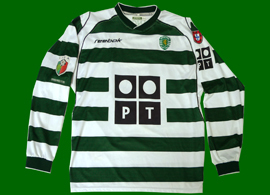 Long sleeved home shirt, match worn by Cristiano Ronaldo. Extremely rare. Away jersey, match worn by Cristiano Ronaldo. Private photo, intentionally blurred. This is a photo of the shirt Cristiano Ronaldo wore against Manchester Uniter on 6 August 2003, in the second half. It was the last game he did for Sporting.